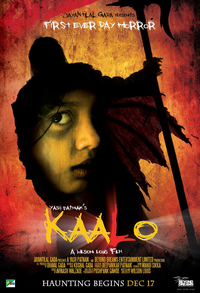 Review Summary: KAALO is an interesting watch for fans of this genre. It has decent merits but few shortcomings too along the way. KAALO is an interesting watch for fans of this genre. It has decent merits but few shortcomings too along the way. Kaalo completely fails in its primary objective - to scare. This one will not even scare a child! 'Kaalo' comes with a good premise. After all there hasn't been any creature based horror film made in Bollywood and that too while being presented in day horror genre. In that context, one does want to check out what 'Kaalo' is all about as it promises good share of scare factor coupled with thrills. The movie will interest the audiences who love the genre, but with lack of publicity and two big releases next week, Kaalo will find it tough to survive to competition.